Arthur Sewall was a transportation tycoon who was selected as the Democratic vice-presidential nominee in 1896. He was born in Bath, Maine, the third son of Rachel Trufant Sewall and William Dunning Sewall; the latter having been financially successful as one of the town’s first shipbuilders and an investor in railroads and other business corporations. After an education in Bath’s common school, Arthur Sewall apprenticed in his father’s shipyard, learning each job, and was sent to Prince Edward’s Island for instruction in cutting ship timber. 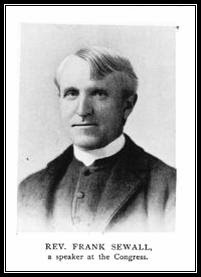 In 1854, he joined his older brother, Edward, to form E. & A. Sewall, which took over their father’s shipbuilding firm. 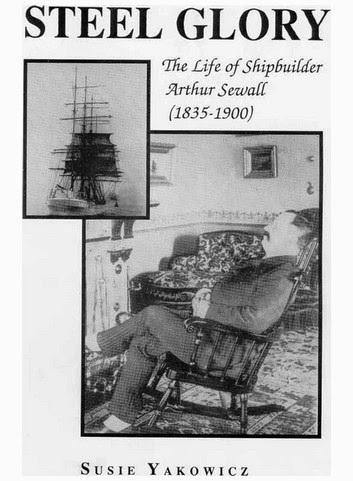 Upon Edward’s death in 1879, the name was changed to Arthur Sewall & Co., and the business managed was by Arthur, as senior partner, with his second son, William, and a nephew, Samuel Sewall. Sewall was also involved in other businesses, mainly in the transportation sector. He was director and for nine years (1884-1893) president of the Maine Central Railroad; president of the Eastern Railroad and the Boston and Maine Railroad at various times; a director of the Mexican Central Railroad and other lines; president of the Portland, Mount Desert, and Machias Steamboat Company (1884); and president of the Bath National Bank (1871-1900). The only electoral offices Sewall ever held were those of city councilman and alderman in his hometown of Bath, Maine. However, he was a leader of the Democratic Party in Maine, served on the Democratic National Committee from 1888 until his death in 1900, and was a delegate at all the Democratic National Conventions from 1872 through 1900, except 1888 (which he did attend). In 1893, he was a candidate for the U.S. Senate, but lost the election in the Republican-dominated state legislature. In 1895, Sewall announced that he favored “free silver,” the inflationary policy of unlimited coinage of silver as a plan to assist debt-ridden Americans (primarily, farmers). That stance had emerged as the majority view of Democrats, becoming the centerpiece of the party’s national platform in 1896. After delegates selected William Jennings Bryan as the Democratic standard-bearer, they turned to Sewall as the vice presidential nominee. Despite his lack of political experience, the shipbuilder’s age, reputation as a successful businessman, Eastern residence, and tariff protectionist sentiment balanced Jenning’s youth, image as a dangerous radical, Western residence, and tariff-for-revenue position. Democrats may also have hoped that Sewall would contribute some of his wealth (estimated at $5-6 million at the time) to the campaign. However, the Populist Party considered Sewall to be anti-labor, and so nominated a ticket headed by Bryan, but substituted Thomas E. Watson, a former Populist congressman from Georgia, as his running mate. 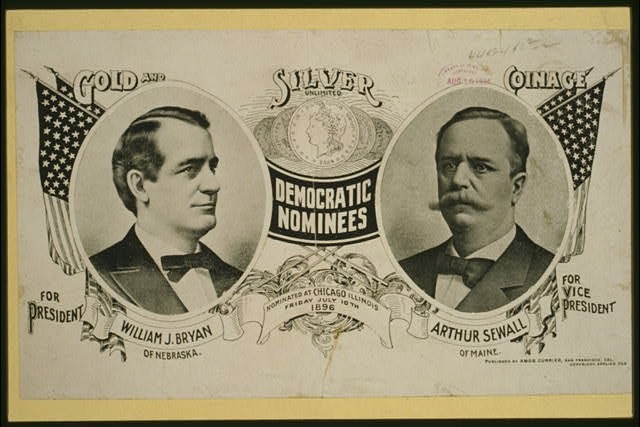 Both Bryan and Sewall campaigned energetically, but lost the election by a substantial margin to the Republican ticket of William McKinley and Garret Hobart. In 1859, Sewall had married Emman Duncan Crooker; the couple had three sons. 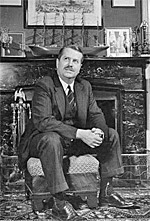 Their eldest, Harold, served as a diplomat in the Republican administrations of Benjamin Harrison and William McKinley, as a Maine state legislator, and as a delegate to the 1896 Republican National Convention. On September 5, 1900, Arthur Sewall died at his summer home at Small Point, Maine. Sources consulted: American National Biography [Paolo E. Coletta]; Gilbert Fite, “Election of 1896,” in History of American Presidential Elections, ed. Arthur M. Schlesinger Jr., New York: Chelsea House Publishers, 1985; Harper’s Encyclopedia of United States History; Harper’s Weekly; The National Cyclopaedia of American Biography; Ships of the World: An Historical Encyclopedia Houghton-Mifflin online; and, 1896: The Presidential Campaign, Vassar College website. Arthur Sewall, ship builder, business man, and National Democratic candidate for Vice-President of the United States, was born in Bath, Me., Nov. 25, 1835, third son of William Dunning and Rachel Trufant Sewall. His great-grandfather, Col. Dummer Sewall, came to Bath, Me., from York, also a district of Maine, in 1762, purchased the site of the present Sewall estate, was an officer in the French and Indian war, and subsequently in the war of the American Revolution. 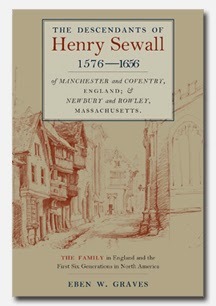 He was fifth in descent from Henry Sewall, who was mayor of Coventry, England. Henry's grandson married Jane Dummer and emigrated to America in 1634, settling at Newbury, Mass. 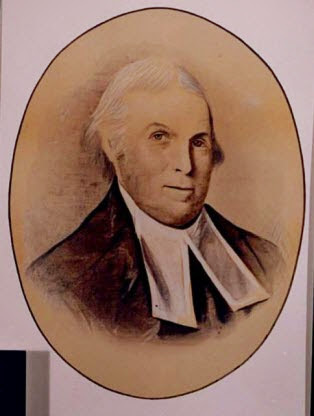 Judge Samuel Sewall of Salem, the first Chief-Justice immortalized by Whittier as the "good and true," who was made famous in the celebrated witchcraft trials of that town, and one of the board of overseers of Harvard, was a son of this Sewall, and his brother, John Sewall, was the direct ancestor of all the Sewalls of Maine. 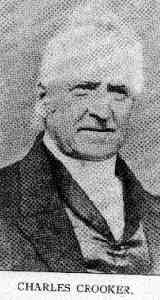 Arthur was educated in the best schools of Bath, and at an early age apprenticed to his father in the ship-building business. Here he passed the several grades of progression, and became a thorough master of the business. 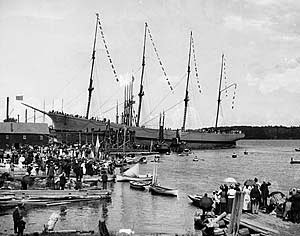 His first visit to the outside world was a voyage to Prince Edward's Island, where he exchanged a cargo of merchandise for ship timber, to supply his father's yards on the Kennebec. Upon his return, although scarcely twenty years old, he, with his brother, Edward, purchased the business of William D.Sewall and Clark & Sewall, and, under the name of E. & A. Sewall, launched their first ship, the Holyhead, of over 1,000 tons burden. This was in 1855. 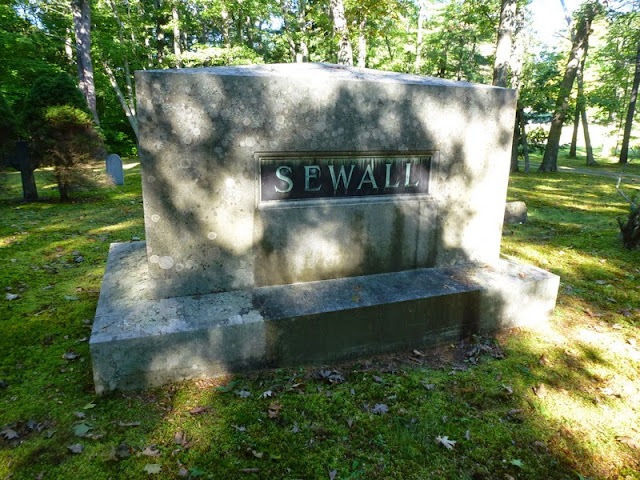 The Bath Sewalls have been closely identified with Bath's chief industry, ship building, since 1823, when William D. Sewall opened the small shipyard on the banks of the Kennebec next to the family homestead. He was succeeded in business by Clark & Sewall. These two earlier firms built twenty-nine wooden vessels between 1823 and 1854. 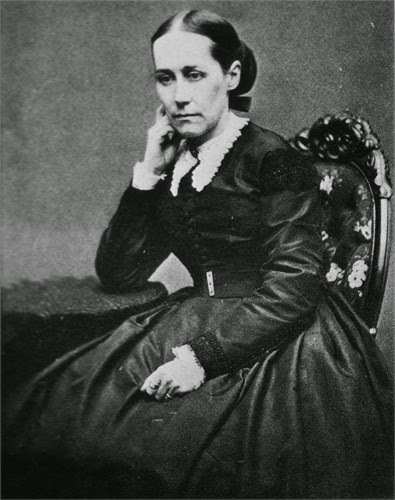 In 1859 Mr. Sewall was married to Emma Duncan, daughter of Charles Crooker, an old-time ship-builder and merchant. She was educated at Ipswich, Mass. She has traveled extensively, is a thorough French linguist, an artist with pen and camera, and a historical student. She is a woman of quiet and refined tastes. 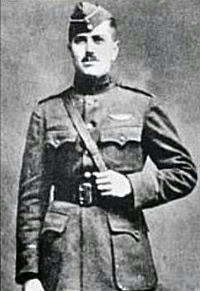 They have two sons living, Harold Marsh and William Dunning, and four grandchildren, Loyall Farragut, Arthur, Margaret and Dorothy Sumner. 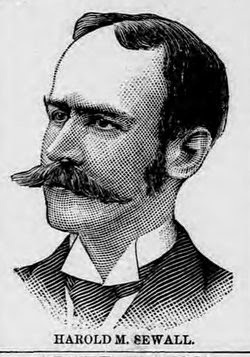 The firm of E. & A. Sewall was dissolved in 1879 by the death of Edward Sewall. This firm, in its twenty-four years of existence, had built forty-six wooden vessels. In 1879 Arthur Sewall, his son, William D. Sewall, and his nephew, Samuel S. Sewall, a son of the late Edward Sewall, formed the firm of Arthur Sewall & Co.
Arthur Sewall is about the only man in the country who has persisted in building ships in the face of what other builders have considered disaster. Before the first administration of Mr. Cleveland grass grew in every wooden shipbuilding yard on both coasts. But Mr. Sewall, believing that a turn for the better soon would come, resumed building, and with greater earnestness that ever before. There followed in quick succession four monsters, each representing a sum beyond $125,000. These were the Rappahannock, Shenandoah, Susquehanna, and Roanoke, all wooden vessels, averaging about 3,000 tons net each, capable of carrying easily a tonnage in cargo of half as much more. The Roanoke was the largest. This ship, built in 1892, measures 3,400 tons, and is now the largest wooden ship afloat. The Shenandoah measures 3,258, and the Susquehanna 2,629. All are magnificent vessels, and as a fleet are classed superior to any other similar fleet, in one control, in the world. In the spring of 1893 Arthur Sewall, having made a tour of all the noted shipyards of the world, to keep abreast of the march of progress in marine construction, returned to Bath and began the equipment of the firm's shipyard for the complete construction of steel sailing vessels, and the first result of this equipment was the launching of the noble steel ship appropriately call the Dirigo. This mammoth vessel, added to those mentioned, composed the largest fleet of sailing vessels in the United States. The Dirigo was launched in 1894, and measures 2,856 tons. She was the first steel sailing ship built in America. To show in what proportion the business of the Sewall's has grown in comparison with the growth of other large businesses of the country, it may be stated that the tonnage of the Indiana, launched in 1876, is 1,488, while that of the Roanoke, launched seventeen years later, is 3,400, nearly twoand-a-half times as great. 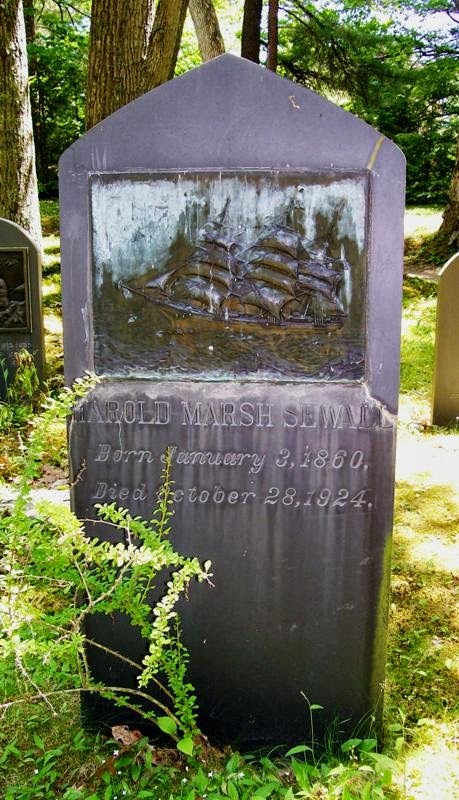 In addition to his large fleet of square rigged "deep water" ships, Mr. Sewall has constructed and manages a large fleet of three and four-masted schooners, which are engaged in the coal, ice and lumber trade on the Atlantic coast. One of these vessels, the Carrie A. Lane, a three-masted schooner of less than 800 tons, was sent some years ago around Cape Horn from New York to San Francisco. She was the first vessel of anything like her kind or size to make this voyage. Besides his extensive interests in shipping, Mr. Sewall is interested in railroads, the Bath Iron Works, which built the United States gunboats Castine and Machias and the ram Katahdin, and other enterprises. If Mr. Sewall could have had his way, and had the conditions been favorable, he would have devoted all his time to the building of ships. His capabilities as a man of affairs have been the means of drafting him into other work. His father had been a director on the Portland and Kennebec railroad, and Arthur took his father's place. He has had extensive connection with other roads, not only in Maine, but in Mexico and the Western States, and he has been president of the Maine Central system. He is a man of executive capacity, excellent business judgment and a good counsellor in business enterprises, and it is perhaps due more to his possession of these qualities than to the ownership of any very large amounts of stock that he has been called to the corporate positions which he has filled. Mr. Sewall is a Mason, and a member of the Swedenborgian church. He belongs to no other society, secret or otherwise. He is president of the Merchant's Marine Association, which has been organized to restore American shipping by discriminating duties. He supported the navigation laws with these arguments: "If for no other reason than keeping our flag afloat, the present navigation laws merit the support of every American citizen. Why, it seems to me that it ought to be worth millions to us to have our flag carried around the world. From the patriotic standpoint, aside from that of commercial expediency, I cannot see how the thought of an American flag flying over anything that is not American can fail to be offensive. No matter what kind of a bill is passed by the friends of the so-called 'Free Ship laws,' owners will put their ships under whichever flagbest suit their purposes, and so, in case of war, the advantages will be wholly on the side of the foreign owner." During the greater part of Mr. Cleveland's first administration Mr. Sewall was on terms of close intimacy with the President, and every appointment which he recommended was made. But the free silver views of Mr. Sewall had at that time caused him to be classed by many of his friends in the East as a man who had gone wild on money questions. As a result of Mr. Cleveland's opposition to silver, Mr. Sewall fought against his renomination. 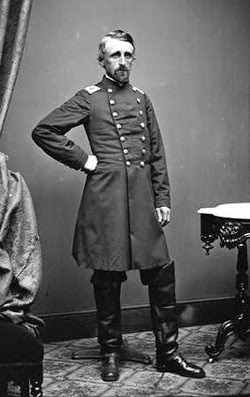 He worked unceasingly for Cleveland's defeat at Chicago, standing for David B. Hill to the end but then came into line and helped elect the nominee. He never ceased to be an active member of the party. 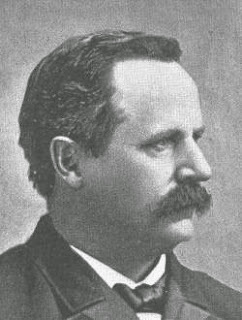 He was the unanimous choice of his party in Maine for United States Senator in 1892, and the attempt to turn him down at the State Convention by a resolution denouncing his free silver views failed. "There are thousands of business men in the East who are turning away from the single gold standard. It is not a class issue. In my opinion there is not a legitimate business in this country but that would be benefited by the restoration of silver to its rightful place in our national currency. demonetized that metal in 1873. I held at the time that a mistake had been made, and have had no reason since to change my mind. "There are two sides to every question, and as an individual banker I have a perfect right to take a position opposite to those who constitute the majority in the banking business. As I said before, this is not a technical question nor a class issue." "It was a great convention, yet it did not seem to me to be a partisan one. It seemed more like the uprising of the people, and they seemed to be controlled by one idea, and that idea has filled me for years. They knew that this country is in deep distress, that it has been in distress for years, and that the great trouble is with our monetary system; and they believe as I believe, that there is only one remedy. They entertain no dishonest or dishonorable idea, but they demand that we be carried back to the money of our fathers, to that monetary system under which this government flourished for so many years, and they believe that is the only road to prosperity." "The keynote of the Chicago platform is found in the Declaration of Independence. It simply implies that wherever the Government comes in contact with the citizen, wherever the citizen touches the Government, that all stand upon a common level, and there shall be equal rights to all and special privileges to no one. "—William J. Bryan. The book by W.H. Bunting of Whitefield, "Live Yankees: The Sewalls and Their Ships," was published April 1. While the title may signify a history of ships, Bunting said last week, "to a large extent (the book) is about people. ... It is largely composed of captains' letters, and the records are 315 feet long." "She thought it was time to have someone take another look at the Sewall papers," he said. "It was a strong belief that this should not be a vanity book. ... (Abbie) just believes in the truth." "I was very fortunate to be asked to do it," he said. "Live Yankees" is essentially a series of short stories that tie together to create a larger story, Bunting explained. "When they began, (the Sewalls) were one of several ... family-owned fleets in Bath," the author said. "They were among the bigger shipbuilders and shipowners." "He joined up with a fellow named Clark, and they ran a store," Bunting said. "In those days, stores were very important because they really were the place where people brought in produce and then exchanged it for West Indian produce. So stores very often got into shipping. A number of the Bath fleets were started from stores ... because the store keeper, instead of trying to pay a ship, he decided he wanted to have one built for him." Eventually the shipbuilding business became prosperous enough that it replaced the store. Two of Sewall's sons, Edward and Arthur, started E&A Sewall in 1854, which took over from Clark & Sewall. That partnership dissolved in 1879, causing the company name to change to Arthur Sewall & Co. Included in that new partnership were Arthur Sewall's son Will and Edward Sewall's son Sam. One of Edward Sewall's sons, Mark, is the namesake for the M.W. Sewall Co., which started serving Mid-Coast communities in 1887. Arthur Sewall is a key figure in the book. He was William Jennings Bryan's running mate on the Democratic ticket in the 1896 presidential election. "It was a very bizarre match-up," Bunting said. "(Sewall) being a capitalist, and a banker, and a railroad president as well as a shipbuilder. And of course Bryan was a man of the people. There's no guarantee that Bryan would have won if Sewall hadn't been his candidate, but having Sewall as his running mate really guaranteed he could not have won. It's an interesting footnote in American history." After Sewall's death in 1900, his younger partners carried on, although the years to follow saw a period of decline. They sold the business around the time of World War I, ending nearly a century of building and managing a fleet of more than 100 merchant ships. That fleet included mostly stout, deep-water square-riggers that carried out trade around the world, Bunting explained. The records Bunting sifted through doing his research – such as reports from Sewall ship captains – paint portraits of shipwrecks, plagues, mutinies, "cannibal isles" and other intriguing elements of seafaring life. The company's most prosperous era occurred before the Civil War. During that time cotton was the Sewalls' major trade. After the war, guano – bird and bat excrement used as fertilizer – became a prime product. California grain and case oil were among trades that followed. In spotlighting the success that the Sewall's business once attained, Bunting also casts light on the more unflattering aspects of the business' architects. "They were notorious for being 'cheese-parers' – skinflints," he said. "And they were just interested in every single penny. Their ships were well-supplied with sails and things, but there was nothing extra. That was right through their whole history, and they were just known as very – 'parsimonious' would be a kind word." Bunting's love of ships and history is telling in pictures on the walls of his house and in the themes of his books. "Portrait of a Port: Boston 1852-1914," "Steamers, Schooners, Cutters, and Sloops," "Sea Struck," and the two-volume "A Day's Work: A Sampler of Historic Maine Photographs, 1860-1920," are among the books he has written. I am a Sewall living in Calif. My father was Edward E. Sewall of Brockton, Mass. This is great info -- thanks so much to those who put it all together. I've purchased the book Live Yankees; looking forward to delving further into my ancestry.